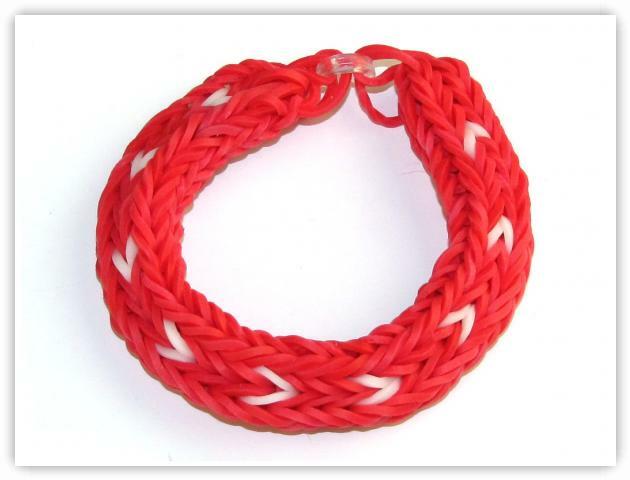 Description: This is a nice bracelet for a Valentine's gift. It is a very thick bracelet, and has 9 white hearts throughout the band. It is also known as the triple fishtail bracelet. You will need about 20 elastics per inch for this bracelet, so make sure you have plenty of elastics handy for this pattern. 2) 114 Red, 9 White, 1 Clip"
11) Repeat this process again with 3 red elastics.